STANFORD, Calif. – For the second straight night, top-seeded Stanford women’s volleyball swept its way to victory in the NCAA Tournament. The Cardinal advanced to the Sweet 16 with a 25-20, 25-15, 25-17 victory over Loyola Marymount on Saturday at Maples Pavilion. Stanford (30-1) extended the nation’s longest home winning streak with its 34th straight victory on The Farm, and will host the NCAA Regional semifinals and finals, Dec. 7-8. The Cardinal has now reached the 30-win plateau for the 19th time in program history and pushed its season win streak to 28 matches, tying the school record. Junior Kathryn Plummer posted her eight double-double of the season with a match-high 16 kills on .519 hitting to go with 10 digs and three blocks. Sophomore outside hitter Meghan McClure added 12 kills on .440 hitting and six digs, while opposite Audriana Fitzmorris turned in eight kills on 17 swings with just one error to hit .412. The junior also put up four blocks for the Cardinal. Stanford recorded its second-highest hitting percentage of the season as a team at .438, while holding LMU to a .144 clip. The Cardinal defense was on display as it racked up 11.0 blocks and 33 digs in the sweep. Stanford finished with just one ace, registered by Fitzmorris on match-point. Junior Jenna Gray dished out 33 assists to go with two kills and two blocks while running the offense. Senior Tami Alade led the team with five blocks, while freshman Holly Campbell added four. Junior libero Morgan Hentz finished with a match-high 13 digs along with seven assists. Loyola Marymount, which is the last team to sweep Stanford at home back in the second round of the 2015 NCAA Tournament, was led by senior opposite Sara Kovac‘s 12 kills. Junior outside hitter Savannah Slattery added seven kills for the Lions. Stanford will face a familiar foe in No. 16 Washington State – the Cardinal swept the Cougars in Pac-12 play this season – on Dec. 7 at a time to be determined. The winner will then take on the winner of No. 8 seed Penn State and Washington in the regional final on Dec. 8. 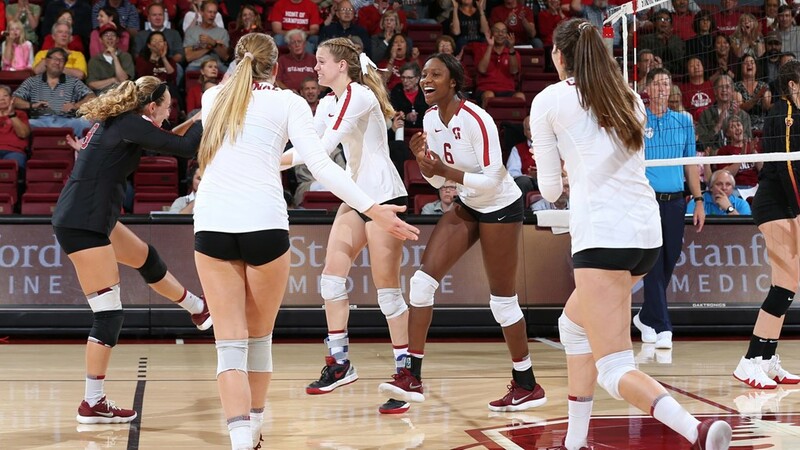 PALO ALTO, Calif. – The Loyola Marymount University women’s volleyball team (21-10) played a competitive final match of the season, but the top-ranked Stanford Cardinal (30-1) proved to be too much, winning in straight sets, 25-20, 25-15, 25-17. The game opened with 10 ties and three lead changes in the opening set. The Lions led 9-6 early on, before Stanford came back to even the score. The game was tied as late as 14-14 before the Cardinal built up their lead. Stanford never trailed in the second set, but LMU did lead 1-0 and 2-1 to begin the third. With the Cardinal ahead later in the set, the Lions scored four straight with Meredith Teague serving to make it a 11-12 Stanford lead. LMU continued to fight, but Stanford pulled away late. Sara Kovac led the attack for the Lions in her final contest, recording 12 kills. LMU’s junior setter Tess Reid totaled 30 assists, all while hitting an efficient 75 percent with three kills. Bo Culo finished with a team-high seven digs. The Lions recorded three service aces, and only allowed one to the Cardinal. In their 14thNCAA Championship, the Lions improve their total record to 9-14 in the Tournament. Including this year, LMU has advanced past the first round in half of their NCAA Tournament appearances.